It’s hard to get a real “hands on” with a device at an event like CES when everyone around you is clamoring for the same shots you want. Still, we spent a few minutes with the Dell Streak 7 and it is impressive. I don’t often use the words “impressive” and “Dell” in the same sentence but right off the bat this thing is faaaaast! The touch screen was responsive and Vibrant and there was no noticeable delay in switching screens. We loaded up TmoNews.com (of course) and it loaded within a few seconds and looked great on the screen. I think this will be a hit with T-Mobile and, while pricing wasn’t discussed, it was said to be “competitively” priced against the current Tablets on the market. 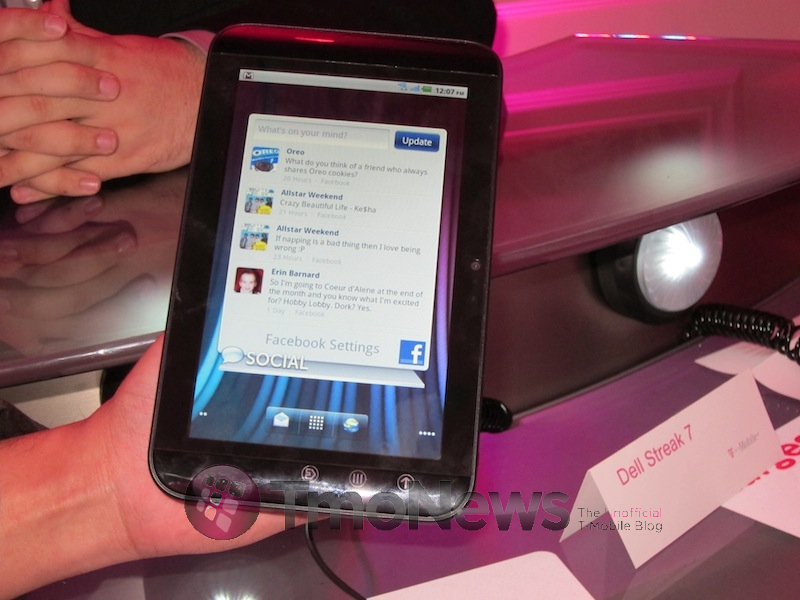 Whether or not T-Mobile will price it lower than the Galaxy Tab remains a question as the on-board 4G is sure to peak interest. I hope they don’t charge a premium for that but they certainly made it sound as though they wouldn’t. This should be a great Tablet for 4G on the go and I wouldn’t say that lightly about anything Dell made! I should actually be able to get one through my govt. contacts within about a week or two! If it looks that good then i dont mind spending those funds. Interesting. Now where are the cool new phones Tmobile? Meh, played with the Dell Streak 5 inch version. If this is anything like it, I’d rather wait for the G Slate. If this is going as far as 2.2 and no honeycomb then its a major fail. Android 3.0 Honeycomb or GTFO! but i rather have a laptop tho. Ok, once in awhile I have to attend to my grammar police duties. we need jumbo phones, where r they? no more cliq2 level, give us premium stuff, although i have nexus s but would love tmo to progress. look at att they have better android line up now. Another 7″ phoneless tablet that nobody needs or wants. I’m not knocking IT but I am knocking its purpose on Tmobile. I don’t really use Google Voice, but I’m wondering if it’s at the point where it can replace voice service…as long as you have data, you should be able to make calls, receiver VM, and text, no? Can someone PLEASE make a tablet that has phone capability?! I’d like to answer my phone by taking out a 1′ phone out of my briefcase.